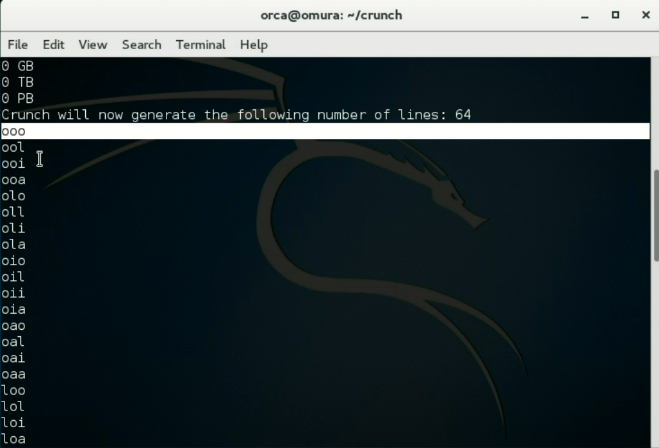 In this tutorial, I'm going to share on how to generate password using crunch. crunch is a pre installed program in Kali Linux that can be used to generate a list of character . 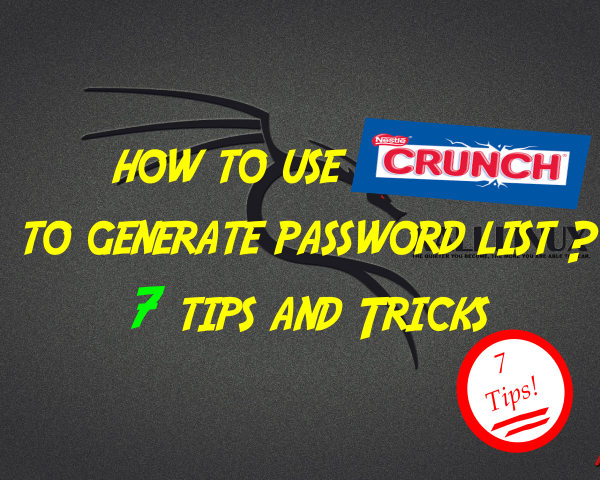 I will cover on practical tips that can be used to generate different kind of password list. This tutorial is suitable for beginner and advance user if you want to refresh some old tricks and tips. How to save crunch output on local drive. How to use specific alphabet character in crunch list output. How to use specific special character in crunch list output. How to use crunch character list. 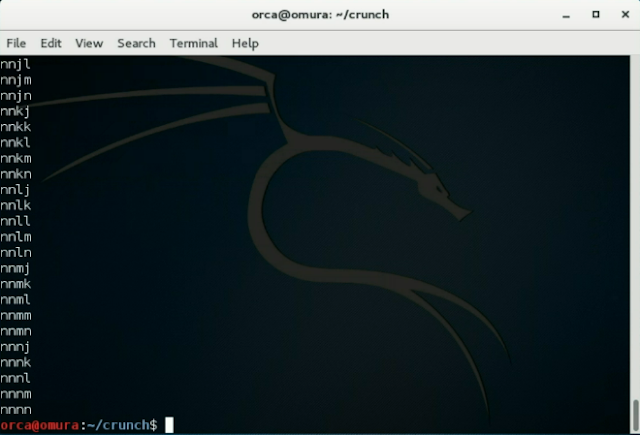 How to invert crunch output result . How to save output on different location. 1) How to use crunch. This command will generate result of 4 minimum and 4 maximum character . Once you press "Enter" a list that start with "aaaa" and end with "zzzz" will be printed out in the terminal. 2) How to save crunch output on local drive. To save the file on you local drive,you can use Linux standard I/O redirection function . In this example, the output file will be saved as "randombasic.txt" . The file can be open by using "cat" command. 3) How to use specific alphabet character in crunch list output. The command will generate minimum and maximum of 4 character for the alphabet "jklmn" and save it to a file calle "specificchar.txt " . The first list will start with "jjjj" and end with "nnnn" . 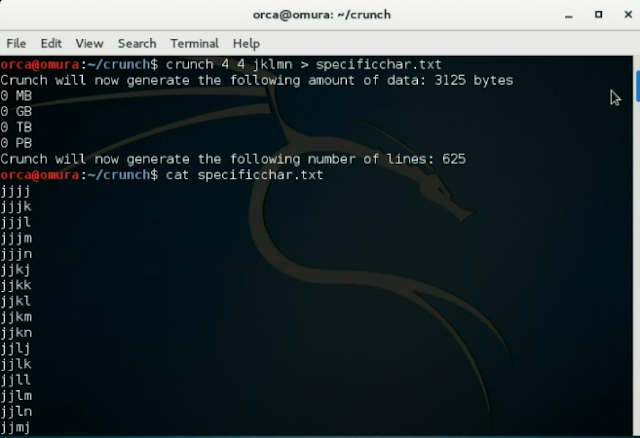 4) How to use specific special character in crunch list output. Beside using specific character, we can also use special character with crunch. To use specific special character, use the backslash "\" symbol between each special character. The generated list will be a combination of alphabet and special character. 5) How to use crunch character list. 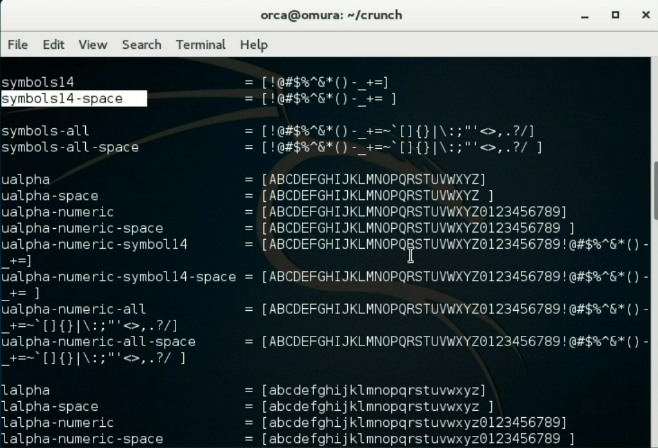 Crunch has a character list that we can use to work with crunch command. 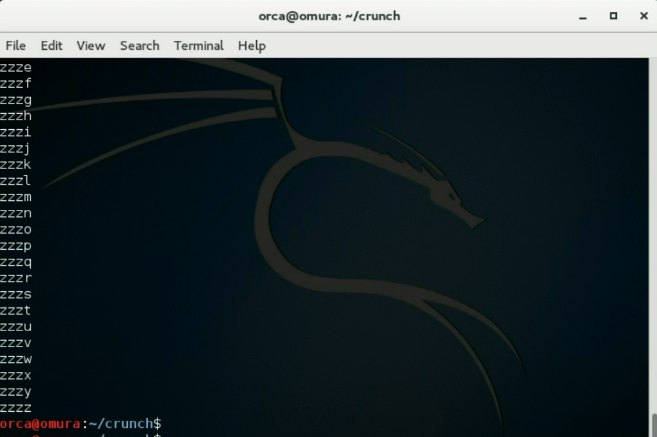 The list is located under "usr/share/crunch" folder with the filename "charset.lst " . The list has two part on the left hand side and right hand side. The left hand side is the profile name and right hand side is the character that is associated with the profile . You need to know the profile name to use in crunch command. 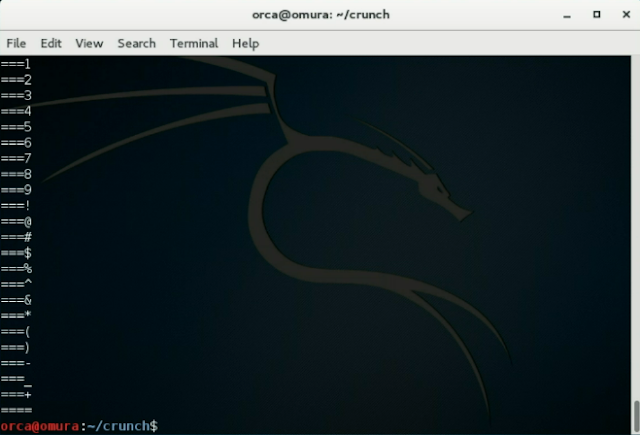 To use the file in crunch command,you need to use "-f" followed with the file location and the profile name. In this example i will use minimum and maximum 4 character and will use character string by adding "-f" followed with the location of the file which is in my current folder and followed with "ualpha numeric symbol14" which is the profile name and save into "from specificchar.txt" file. 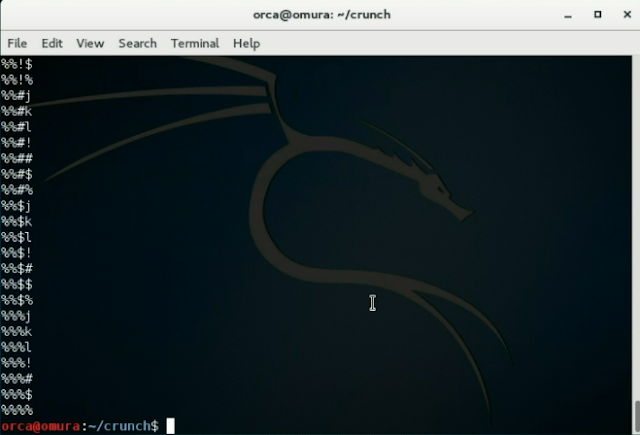 6) How to invert crunch output result . 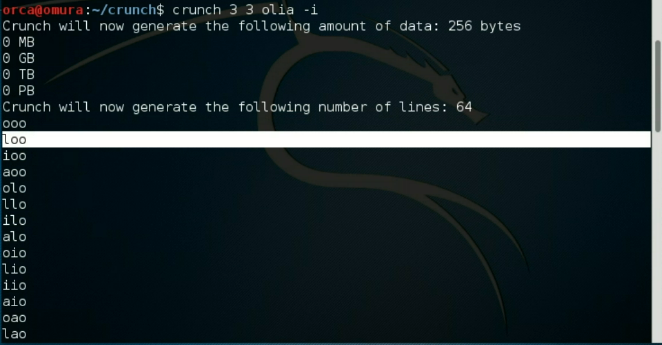 If you want to invert the output from crunch command, you can use "-i" function.In the example below, I'm using minimum and maximum of 3 character for alphabet "olia" . The default first two line of the output will start with "ooo" and "ool" . The output will be inverted as you can see from the first two line result which is "ooo" and "loo" . 7) How to save output on different location. To save output list on different location, use "-o" function followed with the new location. In below example, I save the file in my home folder with filename "diffloc.txt"